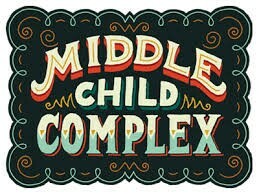 For some time now, I have been dealing with the middle child complex. I didn’t want to realize that he was attributing to some of the behaviors that are associated with the Middle Child Syndrome. As a parent, you want to believe that you have done a great job not to show favoritism when you have more than one child. However, I believe I missed my own memo somewhere. Being that he has an older brother that excelled in sports, he doesn’t want anything to do with sports. I really believe if he could change schools he would play a sport because he has mentioned that he don’t want to live in the shadow of his brother. Another reason I think he is struggling is because at a young age his parents got a divorce. I should have put him in counseling but the kids were going back and forth to each parent's home. We made certain that they knew we were still strong parts of their lives and that we will come together when they need us. So, outside looking into my Sweetie Pie, I see that he is comparing himself to everyone. He doesn’t have a low self-esteem problem, but he is very hard on himself. I am glad we got passed the “I’m not smart” part. He is exceptionally smart. If you have a middle child, what are some of the things you are dealing with? I have to similar problems as you with my middle child. But again I so enjoy your blogs . Keep up the good work and the interesting blog topics. I really love your writing.